Haven’t done much riding so far this year. Jesse and I are meeting regularly for breakfast on Sundays. Lately it’s been cold enough in the morning, maybe high 40s, that I’ve even driven the first 10 miles, then parked and bicycled the last 12 or so to breakfast. Yeah, I know, that must crack up you Canadians. Got stuck this morning riding west into Tempe. I came across an hourlong river of runners heading north on Hayden Road and finally figured out it was the P. F. Chang Marathon. I asked an organizer where I should cross the flow and he told me I couldn’t, and then suggested the freeway AZ202 (quite illegal on a bike). I finally rode parallel away from any “officials” and then nudged in through the runners, carefully cutting diagonally across them. On the way back, I spied these two signs, no doubt erected by some enterprising teaparty enthusiast. The signs cracked me up. 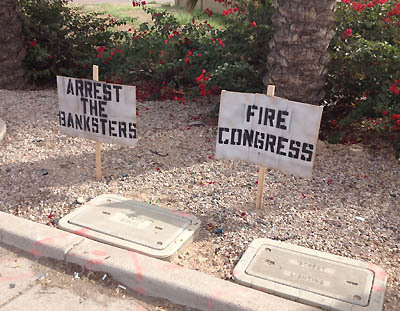 I’ve since learned that the word “bankster” is a blend of “banker” and “gangster,” which made me laugh again.